Smart business starts from the top. That's why choosing the right roofing company is such an important decision. Whether it's roofing for a 6,000 seat sports arena or a 1,000,000 square-foot warehouse, Seamless Systems has your commercial roofing needs covered. At Seamless Systems we have over 20 years experience guarding the best - which is one reason companies keep turning to us for reliable-efficient roofing year after year. 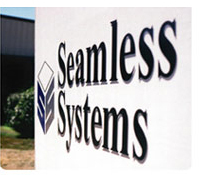 With over 25 million square-feet of roofing experience, Seamless Systems is the right choice for you. Protecting our customers with years of experience and our watertight warranty, it's easy to see why the majority of our clients are repeat customers. From the dead of winter to the heat of summer, Seamless Systems roofing protects not only your business, but your bottom line. Utilizing a specially designed white membrane, our roofing helps reduce heat absorption, keeping your energy bills from going through the roof. We'll even provide a life-cycle energy analysis at your request. The closer you look, the easier it is to see there's a watertight case for choosing Seamless Systems. Our streamline roofing process is durable and attractive. Because Seamless Systems uses high-tech materials designed to age gracefully, you won't have to worry about premature wrinkles. As appealing to the eyes, as it is to your wallet, Seamless Systems offers you energy savings and virtually maintenance-free care.